Guatemala often made me question reality. We so often see recreations of beautiful landscapes or colorful costumes in movies, museums and amusement parks that it’s natural to be skeptical of the authenticity of something exotic even when we see it with our own eyes. Tropical plants, active volcanoes, colorful outdoor markets and charming customs make up the landscape of Guatemala, and it is all very real. There is also poverty, violence and poor education, and the problems are just as real as the beauty. Through the good and the bad, Guatemala was a wonderful and hospitable place during the week I traveled in the country. This is the first of five blog posts with pictures made around the country. 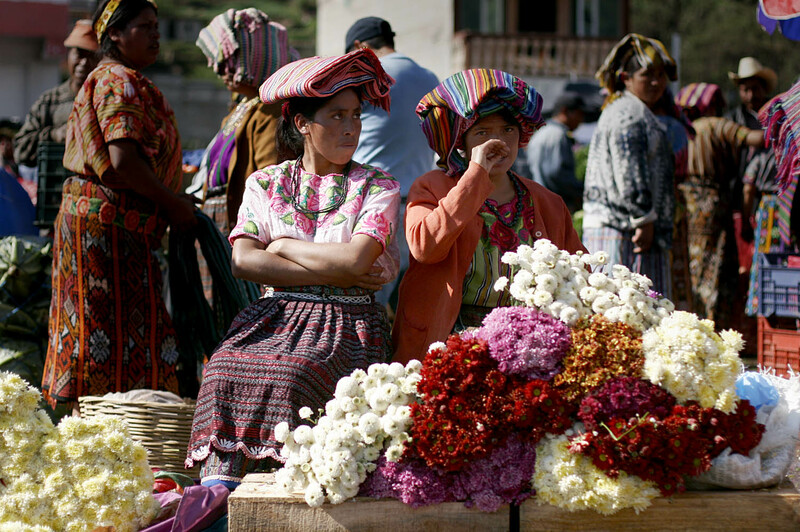 Women sell flowers in an outdoor market in Zunil, a small town near Quetzaltenango. At the market an announcer advertised items over a loudspeaker as farmers hurried around the square carrying huge bushels of vegetables. People cross a cobblestone street in Antigua. 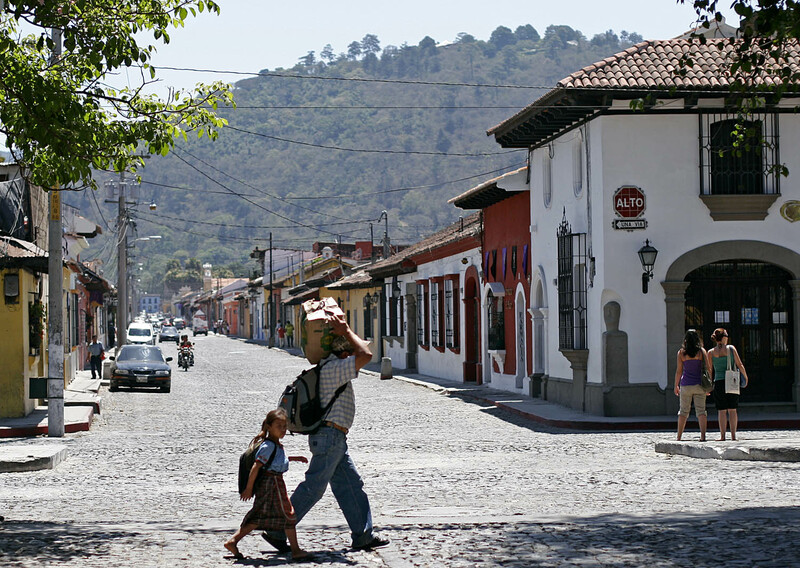 Founded by conquistadors in the 1500s, the city, then called Santiago de los Caballeros, stood as the capital of Spain’s Guatemalan colony until it was destroyed by earthquakes in 1717 and 1773. The official name, La Antigua Guatemala, literally “The Old Guatemala,” appeared after the capital was moved to Guatemala City. Farmland clings to one of the mountains that comprise the landscape of much of the country. 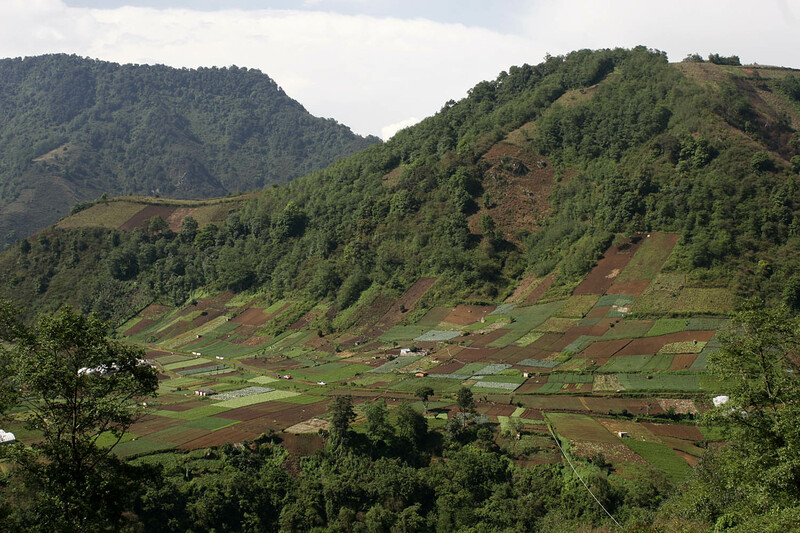 Driving from one area of Guatemala to another consists of being flung back and forth in your seat as the driver navigates curvy, mountainous roads. 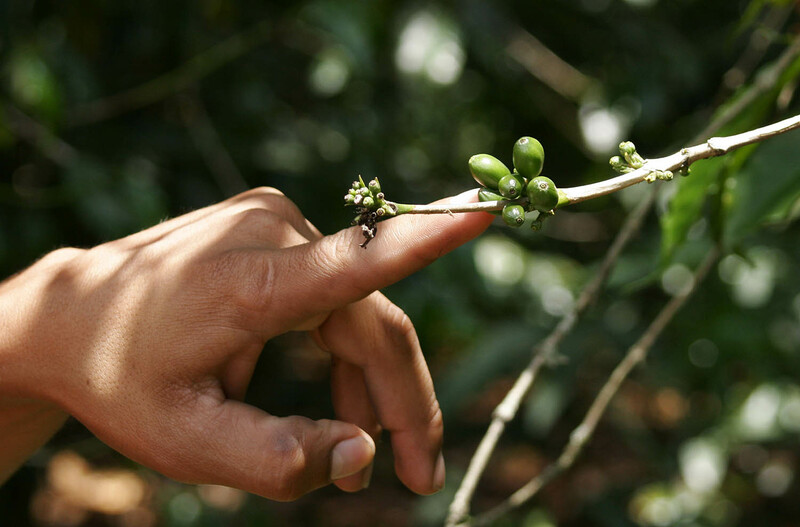 A guide points out coffee berries growing at a plantation in San Juan La Laguna, a city on the shore of Lake Atitlán. When the berries are red, they are harvested and the beans inside are dried and prepared for roasting, grinding and brewing. Coffee is one of the main exports of Guatemala, making the country one of the top ten producers of coffee in the world. Las Fuentes Georginas, a natural hot spring, sits high in the mountains around Zunil, Guatemala. A nearby volcano heats the water that flows into baths around the complex. The steam and relaxed bathers make the springs feel like huge hot tubs surrounded by tropical plants. 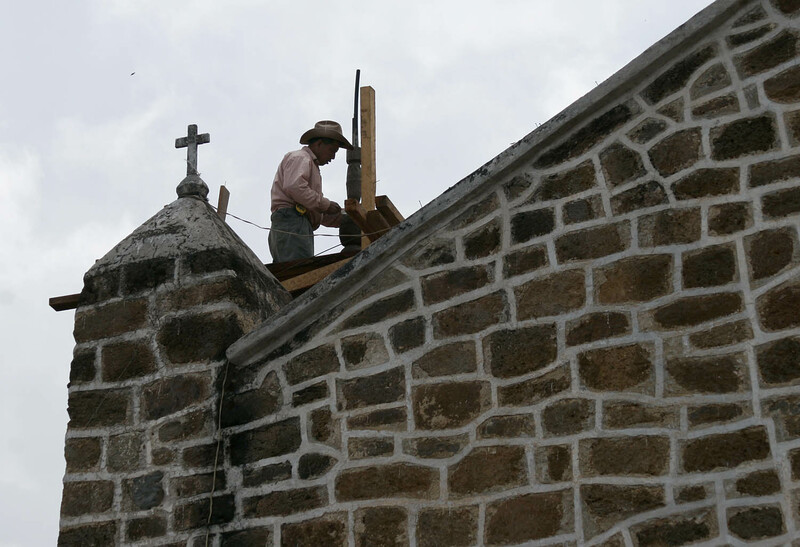 A man works on the roof of a church in San Juan La Laguna. Christianity is very important to Guatemalans, though some have untraditional beliefs. For instance, Maximón, also known as San Simón, is a quasi-Christian figure worshiped in some areas. The saint seems to be a blend of Catholicism and Mayan religions, and worshipers often leave sacrifices of alcohol or tobacco products at his shrines to appease the somewhat-malevolent deity. 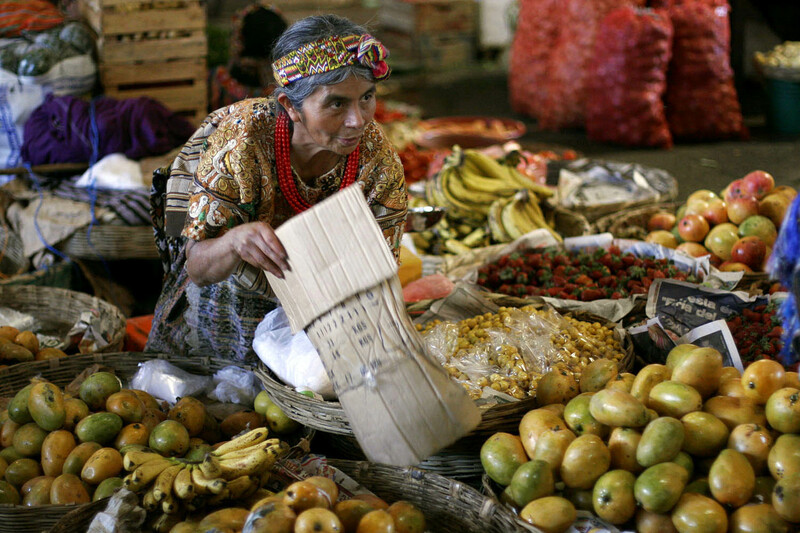 A woman sells various tropical fruits at a market in Zunil. One fruit I tried in Guatemala that I had never heard of was zapote. The flesh of the fruit looked a little like a sweet potato and tasted a like a date. This entry was posted in antigua, coffee, guatemala, market. Bookmark the permalink. Soooo pretty! Is that Becca in the water in that one shot? All of these are so beautiful! Fantastic country with fantastic scenery, beautiful untouched old towns. I hope it remains the same for a very long time, won’t be affected by the wild capitalism that has affected so much of Europe. Guatemala, a colorful country with a big heart!